Gapplegate Classical-Modern Music Review: Morton Feldman, John Cage, Erik Satie, Rothko Chapel, Kim Kashkashian, etc. Morton Feldman, John Cage, Erik Satie, Rothko Chapel, Kim Kashkashian, etc. It is only lately that I realize fully via hindsight that the compositional ways of Morton Feldman, of John Cage much of the time and that of Erik Satie form a triumvirate of now-ancestral musics. What is increasingly clear is that they are the principal pioneers of postmodern ambiance and soundscaping. They have always been in retrospect not thoroughly of the time they were in, even though seen in their day as "card carrying" avant garde practitioners. They spent a good deal of creative effort towards musical sounds that were primarily coloristic and extra-spatially situated more so than melodically-harmonically based as was the case with many of their composer contemporaries. Not of course that there is no melody or harmony in such works. In fact melodically there is often enough some vivid elements there, but the emphasis changes toward atmospherics and overall trajectory. This also is where you can trace the beginnings of music in the "radical tonality" zone. The new anthology of works by Cage, Satie and Feldman on ECM reminds us of their interrelated innovations with some of the classic ambient works of the three. 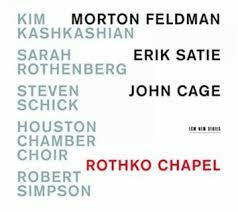 Rothko Chapel (ECM New Series 2378) gives us superior readings of selected works, featuring the Houston Chamber Choir under Robert Simpson, plus Kim Kashkashian on viola, Sarah Rothenberg on piano and celeste, Steven Schick, percussion, mezzo-soprano Sonja Bruzauskas and soprano Lauren Snouffer. The defining thread is Feldman's masterful title work, which expresses in musical terms the effect of a series of abstract, color-soaked paintings by Mark Rothko that are housed in the special building designed for them. Feldman is after the sound impressions that Rothko's works evoke in a ravishing ethereal work for Kashkashian's viola, percussion, celeste, soprano, mezzo-soprano and choir. There is a wide and tall musical canvas on which Feldman creates haunting groupings of color as Rothko did visually with paint. This version is rather definitive. So for that alone the anthology is essential. To surround the Feldman masterpiece of 30 minutes, the artists chose a good assortment of iconic pieces by Satie and Cage, music that sympathetically vibrates in special ways different than, but parallel to "Rothko Chapel." And so we get Satie's solo piano "Gnossienne" Nos. 1, 2 and No. 3, and "Ogive" Nos. 1 and 2, played with special lyrical care by Ms. Rothenberg, along with Cage's related 1948 "In A Landscape." Choral works most fitting to the mood and tenor of the anthology round out the program: Cage's later works "Four2," "Five" and "ear for EAR (Antiphonies)" the latter of which includes L. Wayne Ashley in the solo tenor role. These are not often heard, especially the numbered works as realized for choral ensemble. In fact I don't believe I have ever heard them performed in this way before. They hold their own, certainly, as primary later Cage. Every work makes a statement and the sum of statements make for a convincing case for the interrelated ethos of Cage, Satie, and Feldman. Both the spacious audio production that one expects from ECM and the extraordinary interpretive talents of the artists pull the music together to create an aesthetic unity that is reflective, contemplative and yes, pioneeringly ambient, radically tonal. It is in all ways a disk that excels in thoroughgoing programming brilliance, performative superiority and compositional exceptionality. This doubtless can make an excellent starting point for those who don't know much of this music and/or the composers involved. For those who have been well initiated into the respective realms, it gives you masterful readings and a special regrouping that will give much pleasure and cause you to ponder the historic uniqueness of the music.